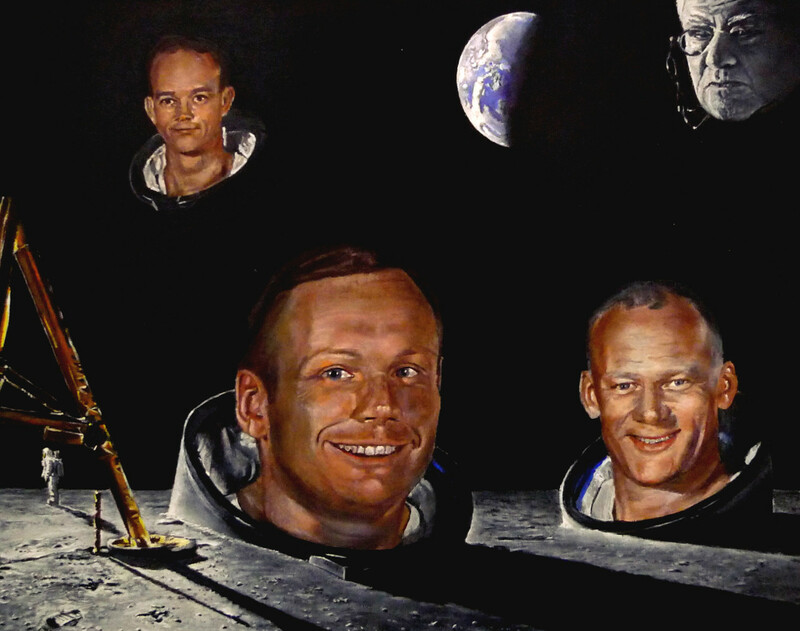 Monuments On The Moon is a tribute to Neil Armstrong (the first man to walk on the Moon) and the famous Astronomer Patrick Moore who both died in 2012. The monuments are Neil Armstrong and Buzz Aldrin on the Moon’s surface. Also Michael Collins is in the Command Module orbiting the Moon, waiting and ready to rendezvous with Armstrong and Aldrin when they take off from the Moon’s surface and rise into space above the Moon. Patrick Moore looks on in wonder at the incredible spectacle of Man walking on the Moon in 1969 before him. Surely Mankind’s greatest achievement! I remember as a teenager of 15, staying up into the small hours of the morning (20 July 1969) watching on BBCTV and to witness man’s greatest achievement. I also remember Patrick Moore’s joy and realisation of his dream come true.